The Richmond Heights Police Department responded to 78 traffic accidents in the month of December, 2014. This is down from the 90 accidents that were handled in December, 2013. For the year, we have responded to 755 accidents. This is 2 more than the same time period in 2013. The Richmond Heights Police Department responded to 63 traffic accidents in the month of November, 2014. This is down from the 75 accidents that were handled in November, 2013. For the year, we have responded to 677 accidents. This is 14 more than the same time period in 2013. 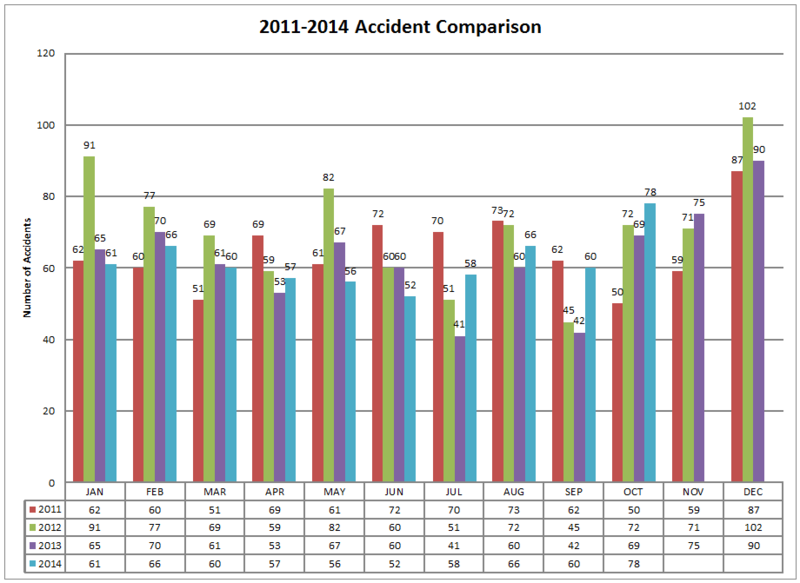 The Richmond Heights Police Department responded to 78 traffic accidents in the month of October, 2014. This is up from the 69 accidents that were handled in October, 2013. For the year, we have responded to 614 accidents. This is 26 more than the same time period in 2013. The Richmond Heights Police Department responded to 60 traffic accidents in the month of September, 2014. This is up from the 42 accidents that were handled in September, 2013. For the year, we have responded to 536 accidents. This is 17 more than the same time period in 2013. The Richmond Heights Police Department responded to 66 traffic accidents in the month of August, 2014. This is up from the 60 accidents that were handled in August, 2013. 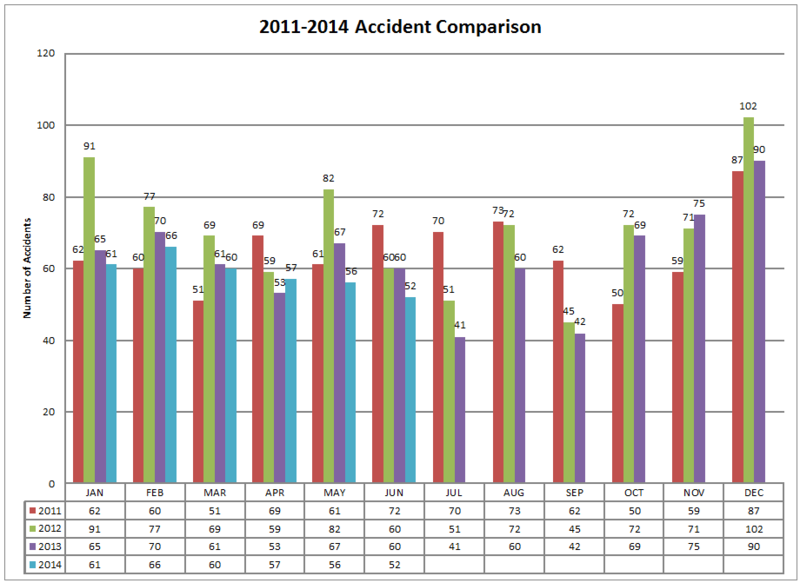 For the year, we have responded to 476 accidents. This is 1 less than the same time period in 2013. The Richmond Heights Police Department responded to 58 traffic accidents in the month of July, 2014. This is up from the 41 accidents that were handled in July, 2013. For the year, we have responded to 410 accidents. This is 7 less than the same time period in 2013. The Richmond Heights Police Department responded to 52 traffic accidents in the month of June, 2014. 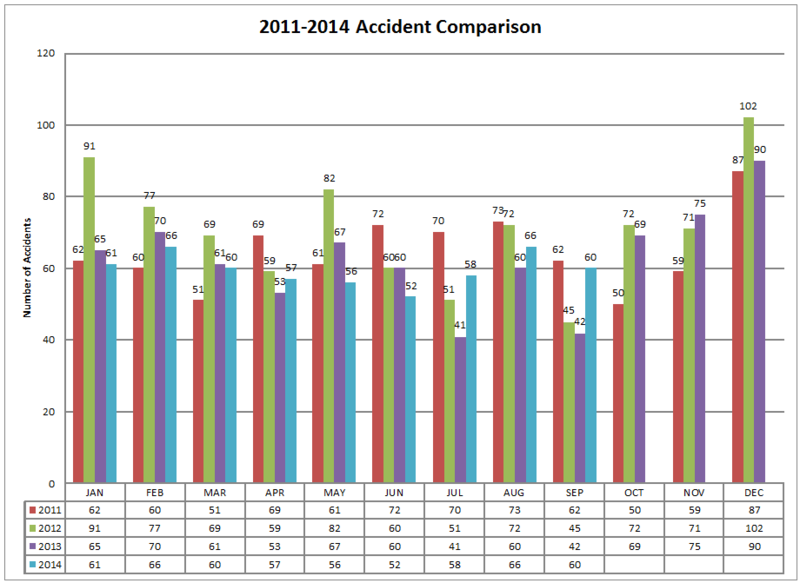 This is down from the 60 accidents that were handled in June, 2013. For the year, we have responded to 352 accidents. This is 24 less than the same time period in 2013. The Richmond Heights Police Department responded to 56 traffic accidents in the month of May, 2014.